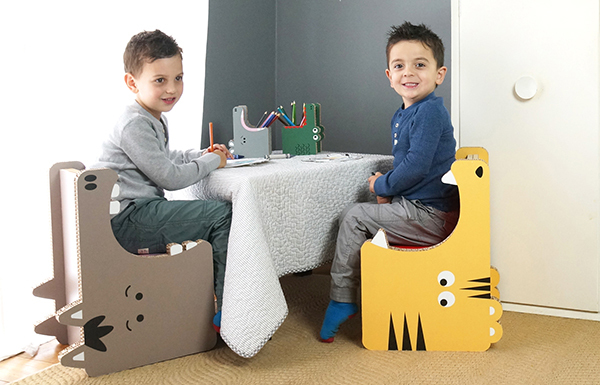 A collection of fun eco-friendly children’s furniture, Gobble by Form Maker is made from recycled paper, making it both healthy for the environment and big imaginations! Inspired by the animal kingdom, the Gobble collection includes four chair designs – Croc, Hippo, Tiggy and Horsey. And because recycled fun comes in small sizes too, a collection of coordinating wares including organising caddies, coasters and magnets is also available to boost the fun in your space. If you like what you see, Form Maker is rallying for support, launching a Kickstarter campaign with a November delivery date should they succeed. You’ll perhaps be surprised to learn that Gobble chairs are water resistant and super strong – though they’re made from recycled paper, they boast an impressive fluted core for added muscle – enough to hold an adult’s weight in fact. When the kids eventually outgrow their Gobble furniture, it comes full circle and can be completely recycled. Support Form Maker with their Gobble furniture goal by placing your pledges and pre-orders now – Gobble chairs currently have an early bird special price of $155, but be quick!